(Sept. 5, 2018) -- A groundbreaking discovery by chemists at UTSA will have a significant impact on how pharmaceutical companies develop new drug treatments. The breakthrough involves fluorine, which forms the second strongest carbon bond (C-F) known to science, after the carbon-silicon (C-Si) bond. Fluorine is one of the most fundamental elements of life. In its fluoride form, it’s a mineral with anti-acid properties used in toothpaste and drinking water to prevent dental cavities. It is also widely used by medicinal chemists in cancer treatment, antibiotics, anti-depressants, steroids and other drugs. Fluorine is prevalent in modern drugs because it stabilizes drugs and improves their biological activity. Cysteine dioxygenase (CDO) and cysteamine dioxygenase (ADO) regulate the body’s thiol levels. When the thiol levels are elevated, CDO and ADO develop catalytic amplifiers to quickly remove thiol from the body. Scientists don’t yet know precisely how the enzymes make the amplifiers. The UTSA researchers were studying this when they made their significant discovery. To expand on their discovery, the Liu lab, including a third-year UTSA undergraduate student, graduate students, post-doctoral fellows and two staff chemists—Wendell Griffith and Daniel Wherritt—utilized a similar approach to determine the catalytic assembly of ADO, a sibling enzyme to CDO. In addition to successfully identifying the catalytic amplifier in ADO, they discovered a unique structural motif that hindered its detection by routine lab techniques. These findings are reported in another paper recently published in Angewandte Chemie, an internationally renowned chemical journal. “Dr. Liu’s laboratory provides excellent opportunities for students to get involved in very interesting and impactful research projects,” said Waldemar Gorski, professor and chair of the UTSA Department of Chemistry. While fluoride is widely used by medicinal chemists in drug treatments, Liu says his team’s discovery should remind pharmaceutical companies that fluorine chemistry is very complex. Although valuable, he recommends that they proceed with caution, because there is still much to learn. This research was supported by multiple grants from National Institute of General Medical Sciences, National Institute of Mental Health, National Science Foundation and Lutcher Brown Endowment Funds from The University of Texas at San Antonio. Learn more about the UTSA Metalloprotein Research Laboratory. 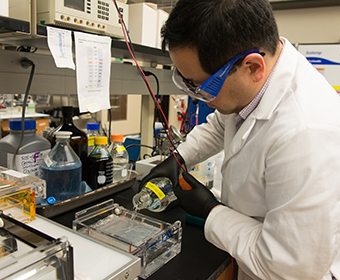 Learn more about UTSA Professor Aimin Liu, who specializes in cofactor biosynthesis, mechanistic enzymology, metabolism and other areas. Learn more about UTSA degree programs in chemistry.